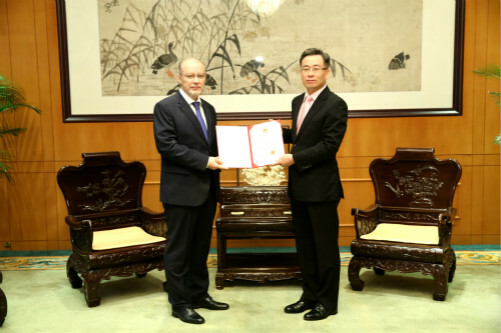 On 22 December, Commissioner Song Zhe met with Mr. Alexander Viktorovich Kozlov, new Consul General of Russia to Hong Kong, and presented him with the Consular Certificate. Commissioner Song briefed CG Kozlov on the current situation in Hong Kong, the implementation of the "one country, two systems" principle and the constitutional development in the city. The two sides also exchanged views on China-Russia relations and HK-Russia business and tourism cooperation.